Welcome to the fifth installment of the 2015 Quick Fact blog series. These posts aim to give you a bite-size overview of performances you’ll find at the Festival this season. Each post in the series includes who, what, when, where, and why. We’ll even throw in some photos and videos to sweeten the deal! 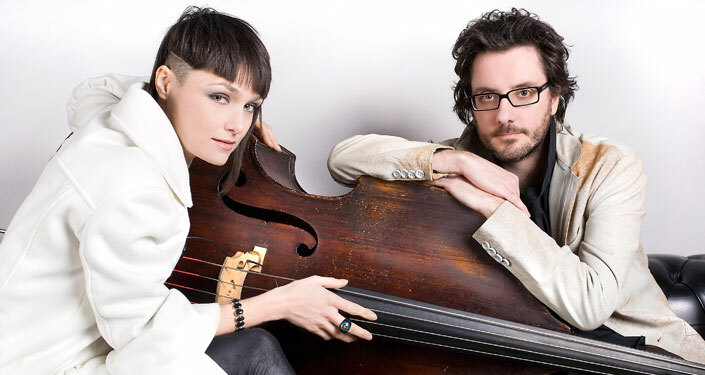 Petra Magoni and Ferruccio Spinetti’s mission is simple: to make music with the bare necessities. The Italian duo fuses bits of jazz, songwriting, rock, punk, and classical music to create their unique sound. College of Charleston Cistern Yard, 66 George Street. Thursday, May 21 at 9pm – Get a jumpstart on 2015 festivities with this Festival-Eve performance! Musica Nuda brings together two very different yet perfectly complementary artists. They have no boundaries; using the art of silence as well as sound. Petra and Ferruccio feed off of each other’s energy and the raw emotion they display in their individual musical forms. The result is a synergistic and stunning performance that focuses on the value of a lyric, a story, and the meaning of every song, whether it’s dramatic, funny, energetic, sarcastic, or romantic. The College of Charleston Cistern Yard provides an intimate and sultry atmosphere, making Musica Nuda a show not to be missed. Musica Nuda is part of the Wells Fargo Jazz series, which also includes Carlos Aguirre, Rita Marcotulli and Luciano Biondini, Kate Davis, Mônica Salmaso, Dianne Reeves, and Madeleine Peyroux. Tickets to Musica Nuda and all other Festival performances are available online at spoletousa.org, over the phone at (843) 579-3100, and in person at the Charleston Visitor Center (375 Meeting Street).